The trope of fictional characters having a life of their own has a considerable precedent, from Flann O'Brien to Raymond Queneau (whose fictional author left the MS by the window and a breeze blew the characters into the street), to Felipe Alfau (whose characters hang out in a cafe awaiting employment by authors), to Gilbert Sorrentino (who acknowledged his considerable debt to O'Brien), to the experimental writer Christine Brooke-Rose and the Italian crime-writing duo of Fruttero & Lucentini (and even back to the second half of Don Quixote). 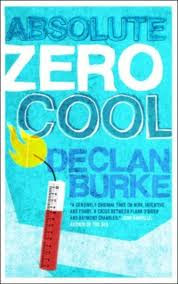 We can now add to that estimable list a further entry, Declan Burke's Absolute Zero Cool (and one of the virtues of Burke's book might be to send fans of his comic fiction back to some of the lesser-known purveyors of characters independent of their authors). A writer who shares some biography with Declan Burke is ensconced in a writers' colony, trying to meet a deadline for the delivery of a new novel, when a character from a manuscript he had earlier abandoned shows up demanding attention. Not shows up in his imagination, shows up in his living space. Karlsson, who now insists his name is Billy (and is sometimes referred to simply as K), wants to be liberated from limbo and begins to collaborate with the author on the completion of the novel. Karlsson's story involves blowing up a hospital, and also the editorial process of "killing babies" (cutting out passages, characters, etc., from a novel in progress). As the author tries to work on his new novel (and also conduct his life with his wife and young daughter), he gradually becomes implicated in Karlsson's story and Karlsson's narrative becomes more dominant as he takes over authorship. 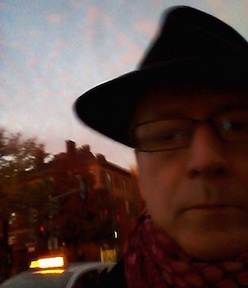 Who is writing whom becomes unclear, with disastrous, even tragic, results. The narrative thus shifts between the author's ordinary life to Karlsson's rambling monologue, peppered with quotations that suggest a broad deep acquaintance with Western philosophy (or perhaps, as the story suggests, a judicious use of Google). Karlsson's voice itself begins to suggest another associate suggested by the author, Patricia Highsmith--not only in her a-moral Ripley stories but also some of her stand-alone novels featuring sociopathic or at least gloomy characters. Among the many crime fiction references, it's Highsmith that resonates most with Absolute Zero Cool (for me). The tale is comic in its structure, though frequently dead serious in its monologues and in its violent conclusions (the final one being a more or less absolute denial of a continuation of the story's telling). It is to Burke's considerable credit that he keeps the reader's interest without pandering to our craving for thriller plots or compromising in the depth of K's philosophical ramblings. It's in part the characters who keep our interest, not only K and the author but also K's love interest, Cassie, and the author's family. 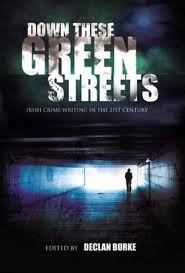 Burke has also recently edited a valuable anthology on Irish crime fiction, Down These Green Streets, which mixes interesting commentary with new stories, all by practitioners and critics of a genre that has become one of the country's important exports. Between the valuable anthology and the innovative novel, Declan Burke has cemented his central position in the current wave of neo-noir and contemporary crime fiction. I enjoyed this book a lot. It's not usually my type of read but it was well written and an interesting concept. I don't usually like/read books where the fictional characters take on a life of their own - I did not like Flann O'Brien for example though I know I'm in a minority, or Jasper Fforde. However, a book that uses this device and that worked very well for me is Broken by Karin Fossum, not (necessarily) one of her Sejer/Skarre novels. (A detective comes into it near the end who is not named but who could be Sejer.) I found it very moving. Sarah and Maxine: Thanks for the comments. I hadn't thought about the Jasper Fforde comparison, which should have been obvious--except that Fforde has a very light touch and Burke veers from comedy toward tragedy.